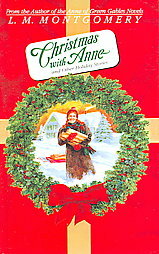 Christmas with Anne and Other Holiday Stories was an excellent pick (for me) for a re-read this Christmas season. I hadn't read it since 2008. Montgomery has so many stories which I love and it's hard to get back to them when there are so many other books in the world. However, when you really love a particular author then there are never so many books in the world that you won't take the time to visit with your oldest and best of friends. ". . . [Y]ou can imagine how delighted I was in 1977, when visiting Montgomery's birthplace in Clifton Corner, P.E.I., to discover a treasure trove: twelve scrapbooks into which she had pasted 360 of her published stories. I discovered later that she had written over 500 stories … not to mention over 500 poems … and, when compiling a bibliography of these stories, I found about 50 more. So, I have a collection of 400 of her 500 stories, and since 1988, have edited seven volumes of these tales. With the publication of Christmas With Anne and Other Holiday Tales, there are 190 more Montgomery short stories in print. I hope eventually to publish them all. This work has been a labour of love. Montgomery's stories never fail to amuse me, to enchant me, to make me weep. I have been delighted to discover that they are as pleasurable to many of today's readers as they are to me." I would like to know how it is possible to "visit" someone's birthplace and discover these things. Was she allowed to crawl around the attic back in 1977!? (Wouldn't that be cool!?) I want to visit a favorite spot of Montgomery's and find a secret. That's unlikely to happen, but I do think that would be fun. Wilmshurst certainly had the discovery of a lifetime and I am glad that she unearthed these stories because I love them so. "The magazines for which these stories were written wanted something topical from Montgomery, tales that would fit the season and celebrate it. Some of the magazines, too, wanted stories that would give the readers, especially the younger ones, a message, and if we find these tales are inclined to tack on a little lesson or give a little sermon at the end, we must forgive Montgomery. She did want, after all, to sell her work, and if a few lines of homily would do it, she would add them." I know that many people do not like Montgomery because she writes such cheery and predictable stories. (And if they do go for Montgomery, they lean towards the Emily books which are darker in nature.) I know that there are many people in this world who had extremely sad and disturbing childhoods. I'm not dismissing the fact (in the least) that evil exists in this world and that not every story has a happy ending. On the flip side of those truths though is that some people do have happy childhoods. And some people do like to read happy stories which promote good cheer and love for the common man. Ironically, despite Montgomery's happy stories she herself wasn't so very positive of an individual. She frequently suffered from depression and illness (and most likely committed suicide). Regardless of her own disappointments though she managed to create a magical world where readers are welcome to come, sit down and relax. She created a mountain of short stories which remove readers from the tension and stresses of life and just let them be for a moment and that is a gift in and of itself. I love her happy, predictable tales. I love that there are morals and lessons attached to them. I am delighted to sit down and breeze through happily-ever-after thoughts. This doesn't mean that I believe in happily-ever-afters all of the time. But I do believe that they are possible. And I do believe that they happen. And I think we should rejoice with those who do experience peace and joy in this lifetime and be glad of it! I love all of Montgomery's short stories and this collection was a favorite of mine as I love Christmas stories. I need to revisit this collection. I read this book last year, I think. It was enjoyable! I didn't know there were so many more short stories available. How cool! I look forward to the January challenge! I'm hoping to read the first two Anne books. And if movies count as well, I'll gladly try to find the first movie! Why don't I own it yet??? Personally I love sitting down to reading cheery stories with happy endings. Life hands me enough "reality", why do I have to have it in every single book I read too. I find part of the fun of reading to be the escape I get from reality and the hard stuff of life. I'm so looking for this at the library! Sounds like some beautiful stories! "In a society that tends not to focus on the happy, I'm delighted to take a moment and rest in a peaceful tale." I didn't know this book existed-- thanks for the tip. I've added it to my Goodreads list! This sounds like a great read. Smiling at the thought of a visitor climbing in the attic and finding stories. :-) But it does make one wonder where/how they are found. YES! YES! YES! I am going to read the first, yes, I said the first L.M. Montgomery books in January! I bought the set of 8 and I am looking forward to this annual event!